#274: Close Races and Third Parties | mark Joseph "young"
This is mark Joseph “young” blog entry #274, on the subject of Close Races and Third Parties. 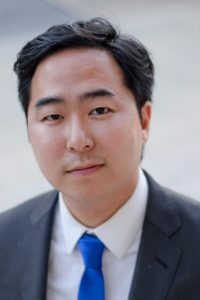 The results are in for New Jersey’s third congressional district, and Democrat Andrew Kim (pictured) has ousted Republican incumbent Tom MacArthur in a very tight race. When the dust settled, Kim had 49.9% of the votes cast, to MacArthur’s 48.8%. That makes eleven of New Jersey’s twelve congressional seats Democratic. We reported on the race in web log post #270: New Jersey’s 2018 Election Ballot, and on the results otherwise in web log post #271: New Jersey’s 2018 Election Results. Neither candidate had a majority; Kim was elected on what is called a plurality, the largest portion of the vote when no candidate has more than fifty percent. It happens when there are third party candidates who draw votes away from the major parties. In this case, it was Constitution Party candidate Lawrence Berlinski, Jr. who took 1.3% of the vote. Obviously people who vote for the Constitution party are not happy with either of the major parties. However, the Constitution party is generally conservative, more opposed to the Democrats than to the Republicans, and if everyone who voted for Berelinski had instead voted for Republican MacArthur, MacArthur would have retained his seat–which might have been a preferred outcome for those three thousand eight hundred forty-six voters. In essence, they voted against the viable candidate they would have preferred, and so gave the election to the candidate they would have opposed. Interestingly, in Maine a system has been created to prevent this sort of outcome, and it appears to have cost incumbent Republican Congressman Bruce Poliquin his seat to Democrat Jared Golden. Maine’s experiment was to have voters not vote for one candidate but rank all the candidates from most preferred to least preferred. Under the old system, the system in place everywhere else in the country, it appears that Poliquin would have won with a plurality of 46.3% of the votes, against Golden with 45.6%. The remaining roughly 8% of the vote was split between two independent candidates (no party affiliations indicated for either). However, since no candidate had a clear majority, the new Ranked Choice Voting (RCV) method was activated. By this method all first-choice votes for the candidate with fewest are reassigned to their second choice, and then if there is still no majority winner the next candidate is so eliminated, until one candidate has the majority (50% plus one)–a perfect tie being statistically improbable. That was done in this race, and the outcome is that Golden defeated Poliquin by about three thousand votes, giving him 50.5% against 49.5% of the vote. Prior to the election Poliquin had filed suit claiming the system was unconstitutional. A federal judge declined to rule on the matter, probably because until the election had been held it could not be known whether the change in system would impact the outcome, so the suit is still pending. It is a very interesting notion which if adopted broadly would be a shot in the arm for third parties. As we see with the Kim/MacArthur race, third parties generally are a drain on the candidate who is closest in ideology to the third party, and thus voting for a third party candidate is effectively voting against the major party you would prefer. Had ranked choice voting been used in the third district, and most of those voting for the Constitution Party had listed MacArthur as their second choice, he would have won. It would mean that voters could vote for third party candidates as their first choice without effectively voting against the major party candidate they would prefer, and as more people recognized this third parties would get more votes, and it would be easier for the balance to tip to push one of the third parties ahead of one of the current major parties. I don’t know that the major parties would want that, though, so I don’t expect the Maine experiment to spread too quickly. Besides, we are still waiting for the courts to rule on the question of whether “one person one vote” means that voters can’t list a second choice.